TRINKETS. It’s a word that tinkles off the tongue. A word that sounds exactly as it is. I can almost touch this word. Hold it in the palm of my hand and roll it back and forth with a flick of my fingers. 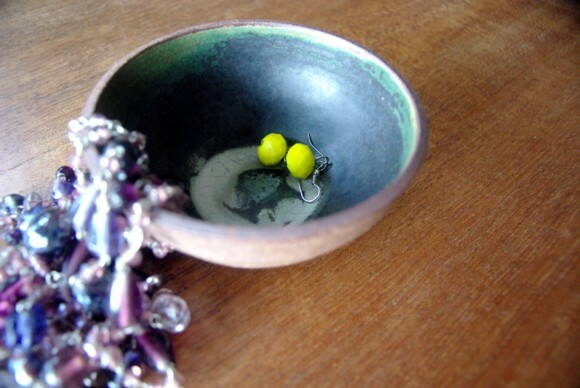 I’ve added this small glazed bowl to my dressing table to hold trinkets. 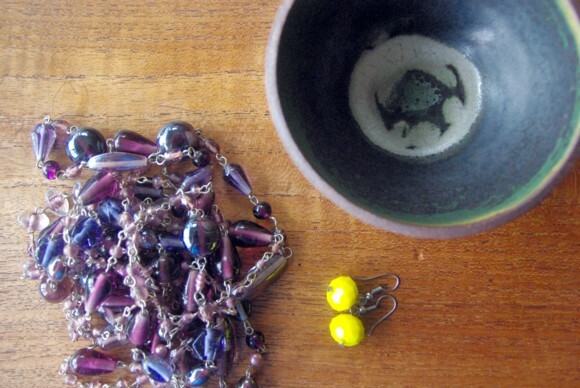 Beads, rings, coins, bobby pins, a smooth rock… things that come and go as they’re picked up, used, worn, moved on, held and spent. The bowl is a trinket itself. I sometimes empty it to see those dollops of glaze and to hold it, hollow, in the palm of my hand and feel its weight. And its frailty. If dropped, it will smash. 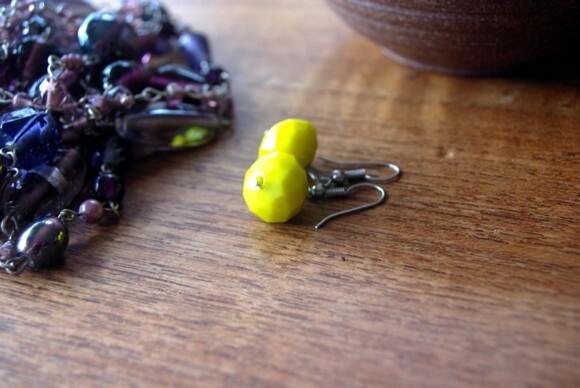 Inside the bowl are strings of glass beads – a gift from the children for my birthday – and these earrings, a cheeky point of light in that quiet dark curve. aww those glass beads are lovely! Such a nice colour. I agree, trinket is a fantastic word- something about it captures that trinkets aren't usually just something you love for the object itself but for what it means... like most of the trinkets hidden around my room have got a lot of sentiment wrapped around them but are actually worth very little. What a nice post. I will admire my own trinket bowl a little more tonight :). PS - I love those bright earrings!